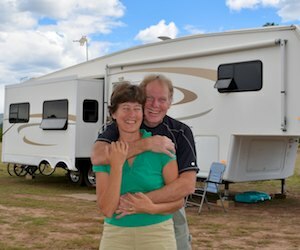 Our RV roadtrip in our travel trailer along the Oregon coast and Columbia River in the summer of 2007 was full of the great discoveries of the full-time RV lifestyle: being free and living without a schedule for the first time in our adult lives. What a great life! It took us forever to return to Oregon, and in the interim we became seasoned full-time RVers and also sailed Mexico’s west coast for nearly four years. By the time we returned to Oregon with our big fifth wheel trailer, in the summer of 2014, it had been on our travel agenda for seven years! This time we came into the center of the state from Nevada, visiting stunning Crater Lake National Park and then settling into trendy and charming Bend, Oregon. From Bend, our RV travels took us to the eastern and northeastern parts of the state which are much less visited but, in our opinions, even more delightful. Baker City and the Wallowa Mountains (Joseph area) were both heartwarming and beautiful.